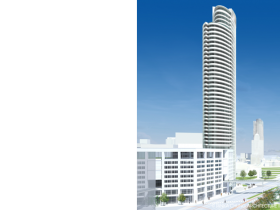 As a long-time resident of the Milwaukee area, I was excited when the proposal for the 44-story The Couture tower was announced in 2012. As my earlier story found, Milwaukee has out-performed most other major U.S. cities since 2000 in the construction of high-rise (at least 18 stories) buildings. However, even within the context of this remarkable overall performance, the proposal for The Couture tower seems extraordinary. That became clear as I did a comparison to other cities, again using data on U.S. high rises at skyscraperpage.com. I tallied all residential towers having 44 or more stories completed in the 67 largest U.S. cities since 2000 (i.e., the 50 largest U.S. cities by population plus 17 cities that are the principal cities in one of the 50 largest U.S. metropolitan areas). Table 1 presents a summary showing there are just 11 major U.S. cities in which at least one 44-story or higher residential tower has been completed since 2000, or is currently under construction. As shown above, the list of major U.S. cities building residential towers of at least 44 stories in this century is short. Furthermore, the vast majority of these towers were constructed during the real estate bubble. For instance, of the 32 residential towers completed this century in Chicago, 16 began construction during the 3-year period from 2005-07, and only 1 during the subsequent 3-year period from 2008-10 coinciding with the housing bust. To better appreciate the trends in high-rise residential construction occurring in the post-bubble or “new normal” economic environment, I separately tabulated totals for buildings completed during the past three years (2011-13) as well as buildings currently under construction. Only 4 major U.S. cities are currently in this “club” – Milwaukee would be the 5th if and when The Couture begins construction. It is probably worth noting some of the major U.S. cities that are absent from Table 1 – every other city in the Midwest except Chicago; every major city in Florida except Miami; every major city in Texas except Austin; and the cities of Boston, Portland, and Seattle. I suspect three factors may play a role in Milwaukee being the locale for a high-rise residential development of this magnitude. The first is an exceptional site. The second is a talented developer, Rick Barrett, who has already managed to complete one significant high-rise building in the post-bubble economic environment (the 30-story The Moderne). The third is a surrounding environment in the nearby downtown and lakefront areas of Milwaukee that is arguably one of the top urban environments for any major city in the U.S. (even if this fact is not fully appreciated by many long-time residents or the many Americans who have not yet had the good fortune to visit Milwaukee). Although the Milwaukee Art Museum addition has become a nationally-recognized symbol of Milwaukee’s urban renaissance, the reality is that any city having enough wealthy and generous donors could build an architecturally notable museum, concert hall, or other civic monument. But a market-driven tower built to make money in the private sector — that’s a different matter. The Couture could in some respects be even more important in changing national perceptions of Milwaukee: it would be a striking physical symbol of Milwaukee’s desirability as a place to live, versus a place to give. 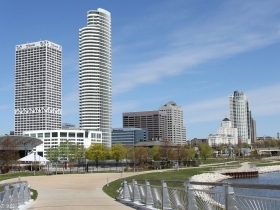 You can’t fake quality of life, or quality of environment – and Milwaukee’s downtown and lakefront have both. David Holmes, a resident of the Milwaukee area for over 40 years, is an environmental scientist and grant writer specializing in the assessment, cleanup, and redevelopment of brownfield sites. He is currently pursuing a doctoral degree in Freshwater Sciences at UW-Milwaukee. In 2008, he coauthored a book, “Chinese Milwaukee,” on the history of the Chinese community in Milwaukee. 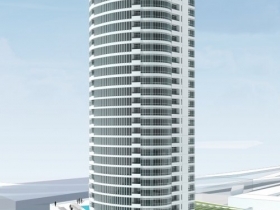 It would be nice if they would build this poposed tower taller than the 801 Grand tower in Des Moines is. Today that tower is taller than any building in Milwaukee. It also stands 607 feet tall, which would still have 1 more story than the proposed Couture building and about 100 ft higher. It’s kind of silly that Des Moines has Milwaukee beat in this category. 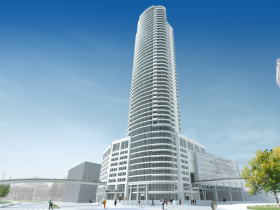 Whether 507 or 607 feet, this proposed tower would be iconic, simply because of the building design and location. I really hope I’m wrong on this, but I really wonder if this will be built at all due to the threat of a lawsuit by the POP group. I can’t imagine any commercial lender willing to finance this structure under these circumstances. Even if POP lost a lawsuit, they could appeal, it does appear they have valid legal grounds with The Public Trust Doctrine. They could drag this thing out, in the meantime, interest rates are already rising and there are other hotel plans being set forth. Again, I hope I’m wrong, but I really have to wonder. It is one thing to get a building of the Moderne’s size built post-recession, but it is another thing entirely to prove out its economic viability. I think the site is truly compelling but question whether or not the demand is there for units rented at a price high enough for this to cover debt service and appraise at or higher than construction costs. 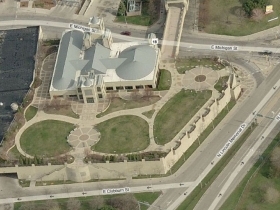 City funding could bridge the gap, but again, I would prefer the city wait on providing Mr. Barrett any TIF Funding until the Moderne is a success (which it may never be). By only looking at major cities, the article missed one hotbed of high-rise construction: Jersey City, NJ (population 247,597). Since 2000, Jersey City has completed 26 high-rises of 18 or more floors, 5 of which are residential towers of 44 or more stories. Since the article seems focused on buildings built since the crash and with residential towers of at least 44 floors, let me point out that Jersey City has 2 residential buildings completed in 2011 (after the crash) of 47 floors each. Four new residential towers of between 50 and 70 stories are proposed for Jersey City plus another five “mixed use” (some residences plus office space) ranging from 48 to 82 floors. Why so many skyscrapers in Jersey City? The easy answer is that it is right across the Hudson River from Manhattan and connected by a pair of subway lines and a highway tunnel. But those conditions have existed for over a century, so why all the tall buildings lately? I believe one key reason is a new light rail line (Hudson-Bergen Light Rail) which began operations in 2000. The light rail line runs through the area as if it were a streetcar. Also, I know of two other US cities with tall (at least 44 floors) residential towers built since 2000 (or under construction today). Fort Lee, NJ is building a pair of 47-story residential towers. I was in Fort Lee last weekend, and one of the towers appears to be near full-height already. White Plains, NY completed a 44-story residential high rise in 2009. If you want to look at recent high-rise buildings per capita, White Plains puts Milwaukee to shame. White Plains (population 56,583) has completed 4 residential high-rises of at least 35 stories since 2000, plus another two of more than 20 stories. While Jersey City and Fort Lee might be categorized as just part of NY City (each is right across the Hudson from Manhattan), White Plains is 22 miles away and is, in many ways, a city in its own right. There hasn’t been any news about the Couture in months. Since the legislature essentially codified the boundaries of the true lakebed the Preserve Our Parks people don’t seem to have a legal position for suit, so what’s the holdup? Can’t they get financing? I thought that was all ready. Is not the name ‘Couture’ inapposite, pretentious and silly? 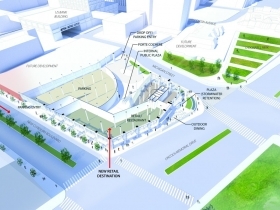 Could not the development have a name that evokes something of the city or the region? Could not an architect of reputation, ability and imagination have done more with the site that produce Moderne 2.0? I consider this development to be an embarrassment and a blight, not because the site should not be developed, but because it should be developed well. Susan, you’re welcome to put your own money, experience & reputation on the line. Embarrassment? Blight? Would you rather have a 50 story beer stein? Plunking a concrete bus fortress on the shore of Lake Michigan is an embarassment & blight. We’d be lucky to have a Moderne 2.0 & hopefully in other areas of the city, we’ll have a 3.0, 4.0 & 5.1 someday. Or maybe a real estate agent who sells houses doesn’t want to compete with beautiful, new condos going up on the Milwaukee lakefront. I’m really sick and tired of plain white buildings in Milwaukee. Pick a color! Or several! I get that architects love white because it makes there design standout, a la the Parthenon. But having two giant white buildings right next to each other would be visually boring. Great article. Thanks. I’m a native Milwaukean in exile and enjoy reading about what is happening back home. I happen to agree that The Couture is boring. Seriously, something other than white, please. I’ve read criticism that it looks more Miami than anything else, and I agree. I think architects have either been afraid to do something bold on the lakefront ever since the MAM Calatrava addition or think that they need to play off of its whiteness. Not in my book. I don’t imagine “the nation” will be wowed by The Couture at all. 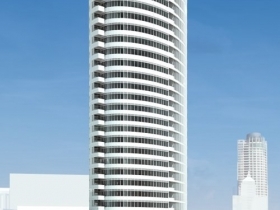 What I’m hoping will make ripples is the design for the new NML tower. The company has already said it is going for “iconic,” and the design architect, Pickard Chilton is known for glass and steel. You know what would really wow the rest of the nation? Fixing “Kilbourntown,” the area downtown west of the river. I say we all agree that the corporte nexus of downtown is east of the river and decide to zone the west side for a lot of housing and mixed use. Forget about building a downtown for visitors. Conventions are nice but staying competitive cost an awful lot of money and Milwaukee will never be a major competitor. And, trying to make downtown convenient for people from the burbs is simply not a helpful approach. Build it for residents and everything they want in close proximity (grocery stores, entertainment, health clubs, entertainment, etc. and you’ll have a real live neighborhood people from all over will be clamor ing to visit. Every time I see those gret old office buildings, I see condo, apartment and live/work conversions. The Third Ward is a great model. I Personally think the couture should be at least 50 stories or perhaps even a bit taller. It would not only be opposing in stature but it would definitely be a really bold statement for a beautiful city like Milwaukee. Also the second tower should be at least 35 or 40 stories. attract tourist ,give them something to look at and tour.